Well, you can stop emailing me now (please). I this morning, I talked to the host of the local access show Ideas at Work and Beyond Ivon Alcime and I'll let him explain what happened last night. Okay, so if you're not able to catch Rev. Shaprton's speech today at noon, you can watch the re-broadcast of the show NEXT MONDAY AT 9 P.M. on Channel 23. In an order to set the record straight regarding the sermon Al Sharpton gave at New Hope Baptist Church earlier this month, tonight HatCityBLOG will be taking over the local access show Ideas at Work and Beyond. 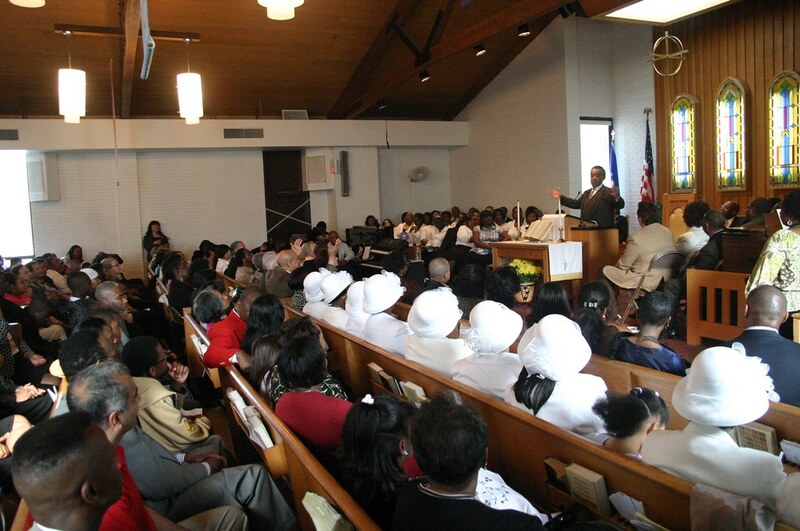 At 9 P.M. on Channel 23, you'll be able to see, in it's entirety, the sermon Rev. Sharpton gave on May 4th. Hopefully, after you watch what happened with your own eyes, the misinformation that was shamelessly reported in the media will finally be put to rest. UPDATE: There were technical problems at Comcast which resulted in the audio not working properly. The show will be re-broadcasted on Friday at 12:00. I will also rebroadcast the footage once my show premieres later this year. Coming soon: SPECIAL COMMENT on the MOST ARROGANT MAYOR EVER! That the only way to describe Mark Boughton's live interview he just completed with the News-Times. For those who missed it, taking a page from yours truly, the News-Times did a UStream video interview with Mayor Boughton where he answered questions about yesterday's bomb threat. 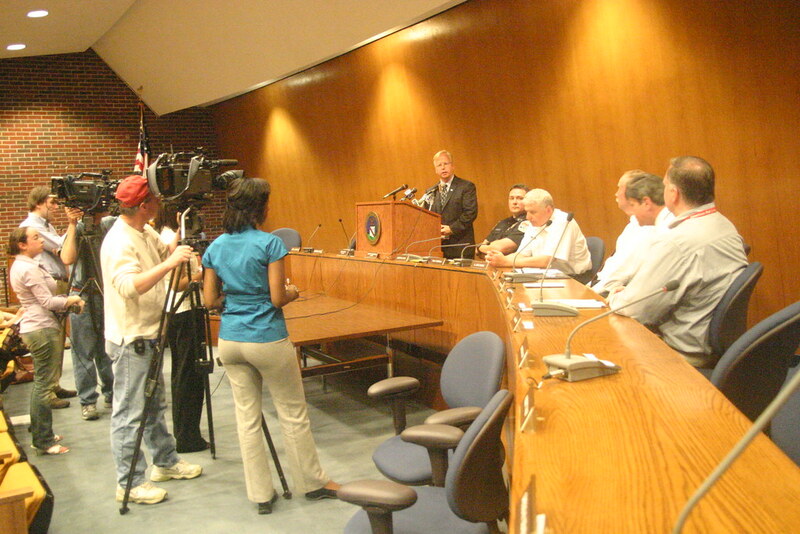 Between he numerous "no comments" issued from the mayor, Boughton gave what can only be considered a flippant and dismissive remark about City Hall not utilizing city's television station (Channel 24) to provide information to the public about the BOMB THREAT EMERGENCY throughout the day. I'll have a special comment on the mayor's remarks at a later time as the response he gave to Eugene Driscoll can not, and shall not, go unanswered (and don't worry Andrew, I haven't forgotten about you). I'm receiving several reports that mirror the complaints WTNH's Crystal Haynes talked about during the City Hall presser. It seems like the number of parents uninformed about today's development is larger than I expected. I'm going back out and interviewing more people as well as getting in touch with sources from the schools. I'll have more later but the level of concern from parents regarding the phone notification is something we'll be hearing more about as the details of today's event unfolds. UPDATE: From what I can figure out, most of the complaints stemmed a couple of factors. • One, the Honeywell message system didn't work for a sizeable amount of parents. This point was acknowledged during the press conference at City Hall. "danbury police and the mayors office"
"regarding Rogers Park danbury police department and the mayor's office"
From several parents I spoke to, the chopped off message left them wondering what the hell was going on, which resulted in them calling either City Hall or the schools looking for information. Now, from what I can gather, this problem was with the automated system from the school system (Honeywell), not the reverse 911 system (City Hall). If my daughter did not have her cell with her, and call me about what was going on,I'd have no way of knowing. The alert i got, my child was with me on are way home......Did not work well at all......Their should be a big concern that this system failed..Is their some one in charge, if their is an emergency? Or some one with a plan? Isnt their a FEMA director in Danbury? There is no excuse for honeywell dropping the ball yesterday. My numbers are all updated with them and with the schools. Instant alert did call my cell phone way after the fact (close to 5:00 p.m.) and after my kids were home for a few hours already. This was a serious situation yesterday and Danbury should make everyone aware of what's going on in situations like this. What the hell do we pay taxes for? Problem No. 1: The city /school system cannot rely soley upon automated systems to notify parents of what is going on. I personally never received ANY notification from the City, I found out by accident. Most parents I've talked with said they found out by word of mouth. Many others received official nofification long after the kids were dismissed or already at home. If this were really a serious situation, there would be a lot of panicing parents with little or conflicting information. Problem No.2: Lack of communication. Friends of ours spent hours trying to track down their son a KS student. They were told he was taken to the firehouse and rushed there, only to be told he was taken to the War Memorial. Since they live near DHS, they had to beg and plead with the Police (who treated them like liars) to get through road blocks. Once at the War Memorial, the only way they found him was by spotting him in a crowd. There was little to no organization there. Problem 3: For the size of Danbury, why for the Love of God is there no reliable live news outlet, like a radio or TV station? The Newstimes did a pretty good job updating us periodically, but they're not really in the business of live news. WLAD used to at least TRY to keep up with local news. Now we just get Debbie Hanley reading the News-times to us, interspersed with obnoxious syndicated programing. 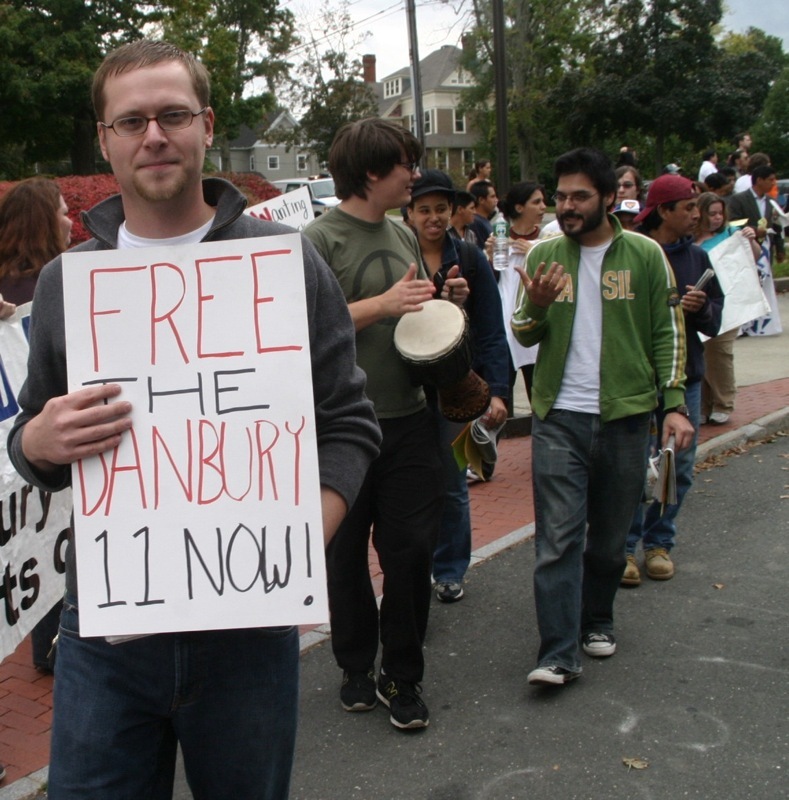 The Danbury TV news station closed up years ago. This city needs a real, live news outlet that can get reliable information to us in a timely fashion. In the end, I'm happy that everyone's safe, but I think that City officials and the Board of Ed have a LOT of explaining to do. Well, there is a Danbury television channel and the person in charge of that system dropped the ball but I'll get into that later. • This student's account of what happened at DHS also mirrors the accounts I heard last night. I am a junior at DHS and I was at DHS when this happened. The fire alarm went off at around 9:40am. I thought it was just a routine fire drill, so I didn't bring any of my belongings with me...big mistake, because now I don't have/can't get any of them until school's open again. Anyway, so the whole school was evacuated. Those of us out front of the school were moved up onto Clapboard Ridge where police and fire trucks blocked off the road and made cars turn around. We were in front of the school on Clapboard for close to an hour. Then, we were walked down Clapboard Ridge onto East Gate, where we were told that buses would soon arrive to take us home. Those students who were fortunate enough to have brought their car keys outside got to drive themselves, along with anyone they could squeeze into their car, home. Many students(and teachers who did not have their keys) waited and took buses home. A large amount of kids walked home. I walked from East Gate about one and a half miles to my house because I did not want to wait for a bus, I didn't know my bus number, and teachers permitted us to walk home if it was nearby. There were tons of kids walking on the shoulders of Clapboard Ridge. The situation was fairly chaotic, what with all of us students and teachers walking on Clapboard and not really knowing what was going on and then trying to figure out how to get home. But, it all worked out. I'm out of school, but my younger brother goes to middle school and my father wasn't home, so I picked up the phone and got an automated message stating that it was a call from the city of Danbury and to press 1 stating that I received the call. But there was no message attached to it. The second call I received was at 12:39 stating that the middle schools were being closed at 12:30.... I think that the call should have been placed earlier. For the most part, it must be stressed that although everyone is safe, moments like yesterday are great opportunities to look back at what went wrong and how the system can be improved in the future. Knowing parents, the complaints about the system will be heard loud and clear by the school system and will be addressed. • Another MAJOR COMPLAINT from many residents stemmed from the fact that the Danbury Public Access channel (DanburyTV, channel 24) was not utilized during the incident. It didn't even occur to me that, during the press conference, that the presser wasn't being televised live. 1. The city of Danbury has access to channel 24 on Tuesday (the day of the incident), Thursday and Saturday. 2. The person in charge of the public access, Community Services Director Ted Cutsumpas, was present during the entire conference (watching the event in the back of the room) YET didn't seem to think about broadcasting the event as he was watching it. If the person in charge of Community Services was able to stand, sit down, and watch the ENTIRE press conference in the middle for an emergency, why didn't he think about broadcasting the event for the public? It's not like anyone needed to operate the camera since all that was needed was a camera focused on the podium where the mayor and city officials were taking questions. 3. Cutsumpas knows how to operate the camera and system on his own. 4. Throughout the day, DanburyTV text did not update with critical information on yesterday's event. Yesterday's event exposed some serious problems with a system that we pay for with our tax dollars. Cutsumpas inaction in terms of broadcasting the press conference on Channel 24 (again, Ted sat and watch the ENTIRE press conference) is inexcusable especially when the channel is used to promote things on the mayor's agenda. On a day where channel 24 could be a source of information, the person in charge of the system simply dropped the ball (and could probably care less that he dropped the ball). Obviously, the Honeywell system needs to be looked at and the complaints from parents need to be addressed. Got a gripe about yesterday? Leave a comment or email hatcityblog@yahoo.com. Here's all the television reports on today's events in Danbury. Don't have anything from WLAD. I'll update this post if FOX61 does a report. Video footage from today's press conference on the bank robbery on Newtown Road and the bomb threats which closed King Street and Danbury High School will be posted shortly. UPDATE 5:30PM: The following is RAW unedited footage of today's press conference. Mostly, the presser with informational with the mayor and those in his administration describing the chain of events from today. The only interesting point came when WTNH's Crystal Haynes brought up a concern from parents who were upset that they were not notified of the situation via the phone system. According to the answers to Haynes question, it was admitted that the system failed and there were different phone notification services used during the incident. One from the school system (which apparently failed) and the other from the reverse 911 system. According to the representative from the school, most parents were not notified because their cell phone were not the primary contact number to call. Looking for clarification, I asked a follow-up question to the mayor regarding who was notified on the reverse 911 system in which he stated people who lived in the area of the incident. Finally, I asked the fire chief a follow-up about the notification system as he was discussing the topic with another reporter. Another sidebar angle to the story is whether or not the whole thing was a prank (a.k.a., senior skip day). WFSB's Aleesha Chaney interviewed several kids who thought the whole thing was just a joke and asked the mayor about it. I'm sure this will be included in her report. It looked that the question of the phone system was going to be an sidebar story at some point but as of now, most news outlets are still focused on the bomb threat itself. Total runtime, aprox. 18 min. NOTE: This video is RAW and unedited. There is some shaking from me fixing the camera on the tripod. For the life of me, I can't understand how someone wearing a straw hat and a camouflage outfit, can rob a bank and get away on a bicycle. I mean, this happened at the Bank of America over at Newtown Road and it isn't like there's a whole lot of places where this person can hide. 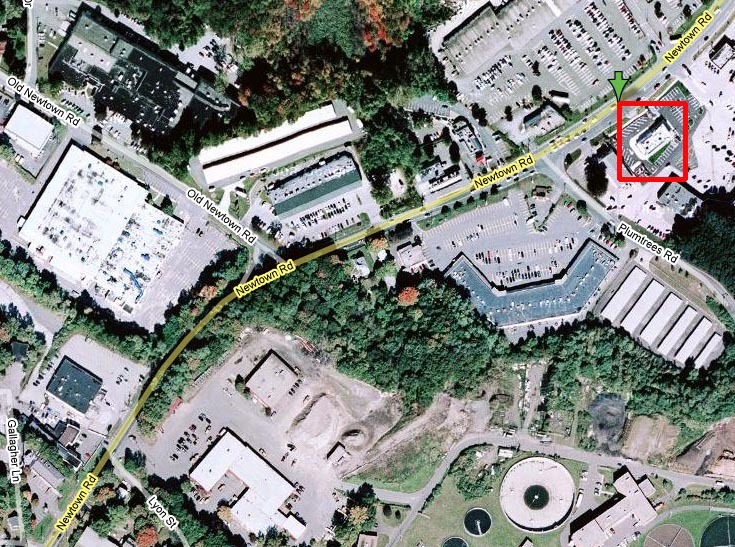 Here's a map of the location where the robbery took place (the bank is highlighted in red). Now, looking at the map, that area is basically a light industrial area with hills in each direction on Newtown Road. Now, if this person took off on a bike, in what direction did he go where he couldn't be found by the police? I mean, we're talking about a guy WEARING A STRAW HAT folks riding a bike on that section of Newtown Road. UPDATE 6:00 P.M.: Crystal Haynes went with the phone notification problem in her 6 o'clock report and interview several upset parents while WFSB went with the "prank" angle. I have everything tivo'd and I'll upload the clips later. Seems like the phone problem angle has legs since the city admitted that it failed. I'll post all the television reports in a post later tonight. Seems like residents in Danbury can't help themselves from expressing their true feelings about immigrants...even on Memorial Day. Danbury's Carol Bundergaard has watched the parade wind its way through the city for more than 50 years. "It's a lot more multicultural than its been in the past," she said. "But I like that veterans are still the main theme." 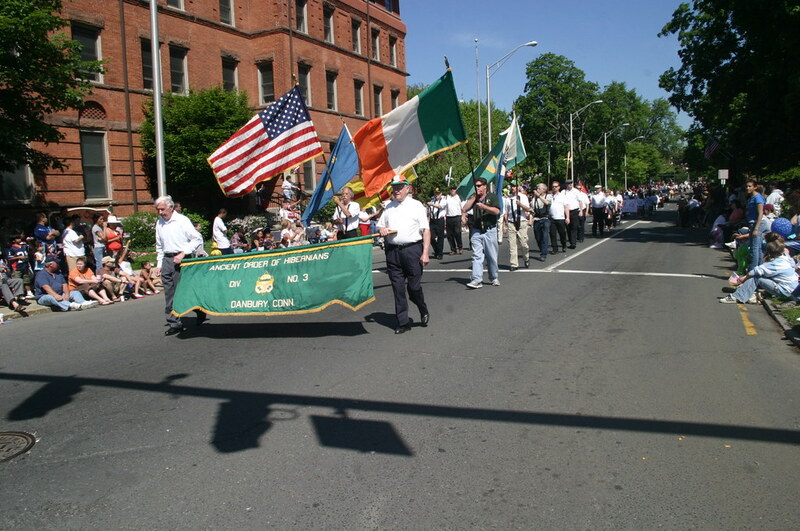 With Germans, Italians, Polish and Irish immigrants having roots in the area going back many generations, it's safe to assume that she wasn't referring to the various European "multicultural" organizations (such as the Ancient Order of Hibernians) that have participated in the parade in the last five decades. Having Obama step in for Ted Kennedy and speak at Wesleyan University has become a MAJOR media event and to have a blogger there covering all the activity is pretty amazing. UPDATE: Here's the video and text of Obama's speech. Thank you, President Roth, for that generous introduction, and congratulations on your first year at the helm of Wesleyan. me to be a part of your graduation. personal heroes and a hero to this country, Senator Edward Kennedy. there was no way I could fill his shoes. our champion, and we hope and pray for his return to good health. that is synonymous with his family’s name and their legacy. because they did, they changed the world. two different stories at work in our lives. served this country in ways that have forever enriched both. not for the purpose that service gave my own life. times when I wasn’t sure where I was going, or what I would do. would work at a grassroots level to bring about change. offered me $12,000 a year plus $2,000 for an old, beat-up car. helped people live lives with some measure of dignity. But I also began to realize that I wasn’t just helping other people. years to come. And I say “chance” because you won’t have to take it. to keep your story separate from America ’s. Kenya to bring alternative sources of energy to impoverished areas. take on the common challenges that confront all humanity. believe in, and find a way to help them. cynicism and so much doubt, we need you to make us believe again. from the nation as a whole. ground, even for those with the best of intentions. times when you are tempted to take their advice. they could make their voices heard, many for the very first time. didn’t know much about the life of Joseph Kennedy’s youngest son. that Ted Kennedy is not done just yet. 2008, and congratulations on your graduation. Thanks to Robert Greenwald and Brave News Films for the laughs.